Hi everyone! I hope you are having a great weekend so far. I'm still playing with the bird theme for this week. I suppose I'm looking forward to Spring! 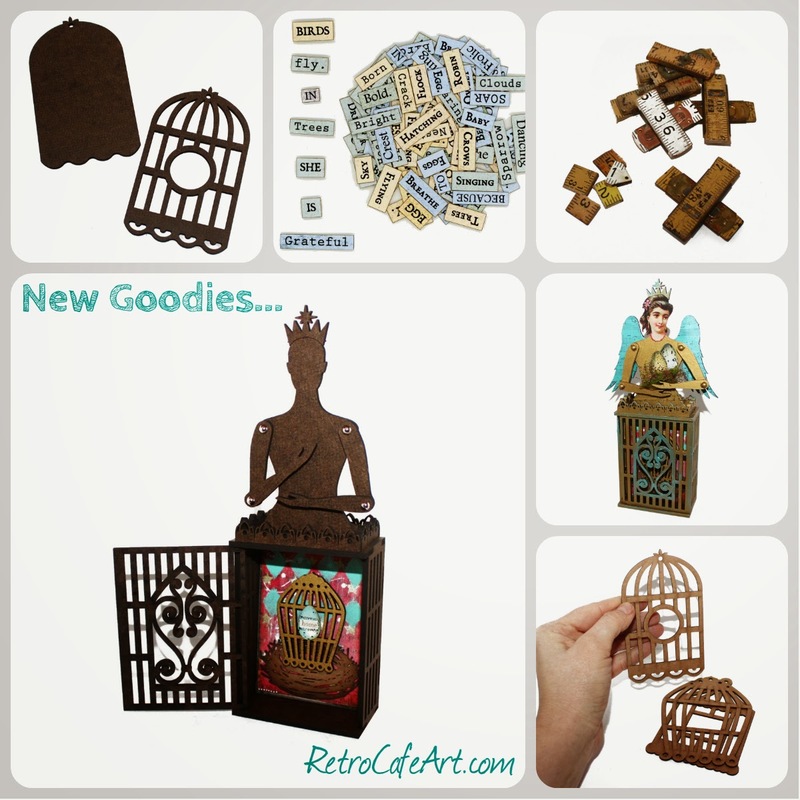 I'm especially excited about our brand new Bird Cage Dolls that hold ATCs! 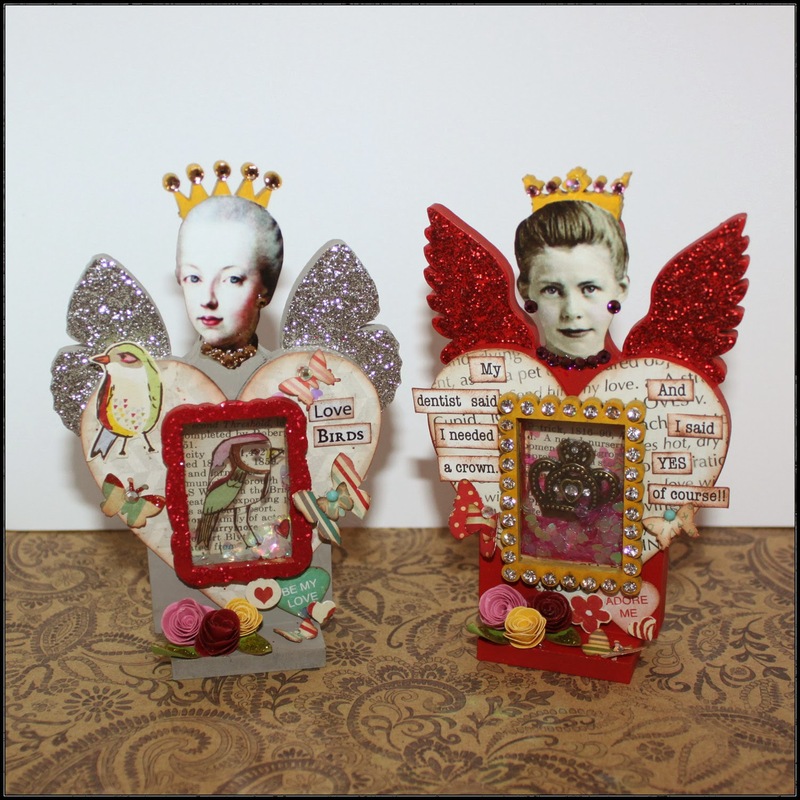 They are the perfect mix of our Theatre Dolls and Door Shrine Kits. The Folding Ruler Joints are also a must grab! I had a blast playing with our new 3-D Bird Cage Doll! First I painted her with FolkArt Gold Acrylic Paint. I used Turquoise Inka Gold for some highlights and for her wings. I added some stamping, and then made a nest with some moss and added some Egg Paper Cuts! I really enjoyed the Inka Gold. Because I was working on a painted surface, I was able to wet a paper towel and wipe off any Inka Gold if it went where I didn't want it to go (bonus). Also, FYI, if your Inka Gold dries out, placing a baby wipe inside the container over night will revive it! Isn't this Dress Form Art Doll by Marie Garot just stunning? I absolutely loved her bird theme which fit right in with the new goodies. 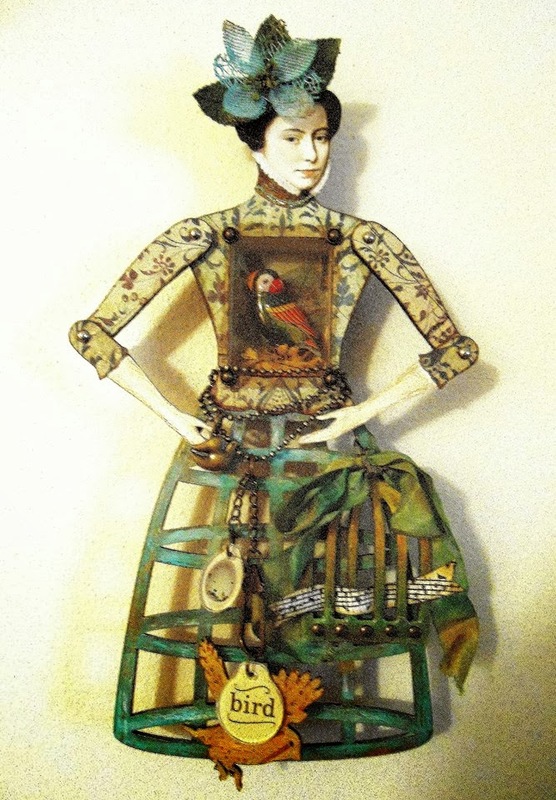 Her doll was part of the inspiration for the new Bird Cage Dolls! The Santos Head she picked is just perfect for this piece too. Simply stunning Marie! Thank you so much for sharing! 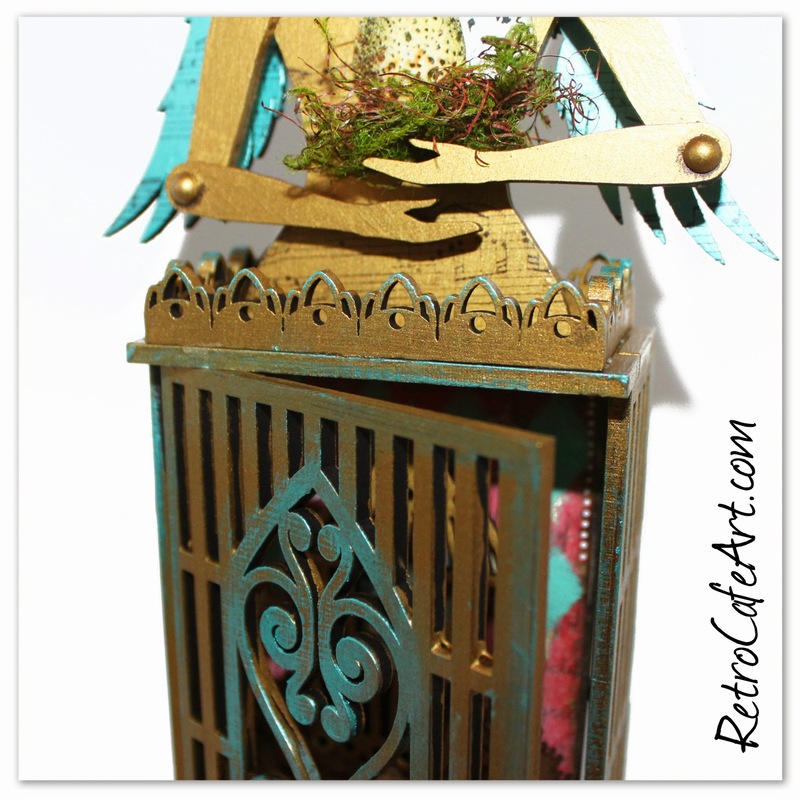 Design Team Member Linda Cain created this breath taking piece using our Santos Doll Shrine Kit. Hop on over to Linda's blog for more photos and instructions. Can you believe the awesome stamping on this piece? Amazing Linda! See more HERE on Linda's blog. Go say Hi! 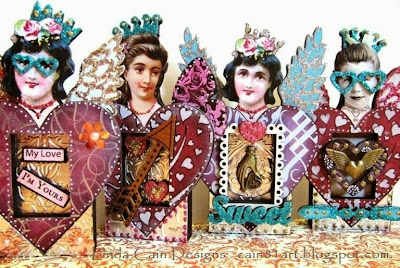 You still have lots of time to join in the Sweet Heart Fairy Shrine Swap! Fairies are due February 24th! 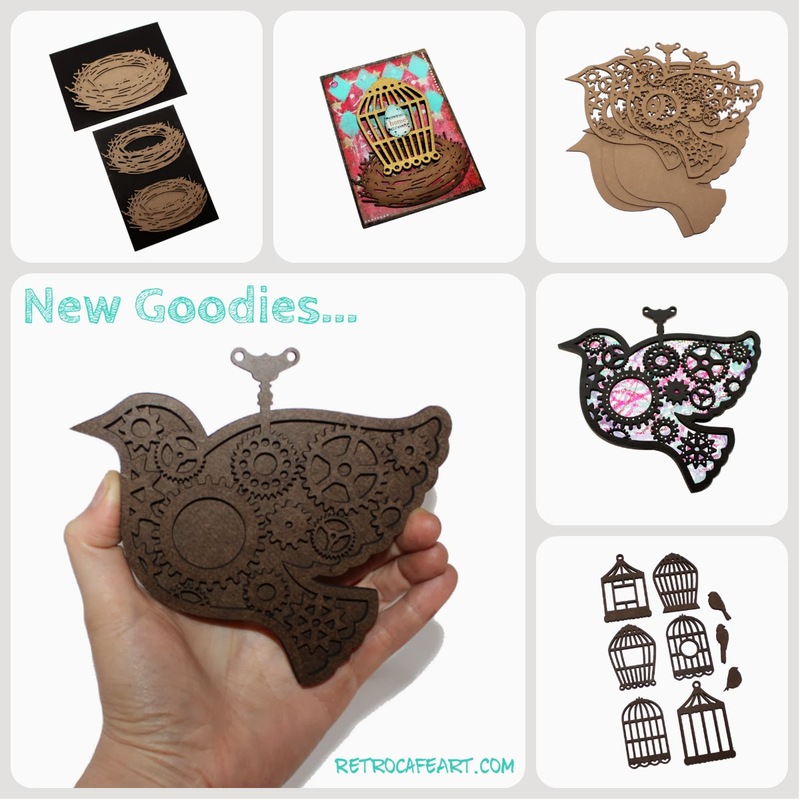 Steampunk Birds, Nests, and More! Happy Saturday everyone! We have some super fun new Birdy goodies in the shop! I love them all, but for some reason I'm quite smitten with the nests! 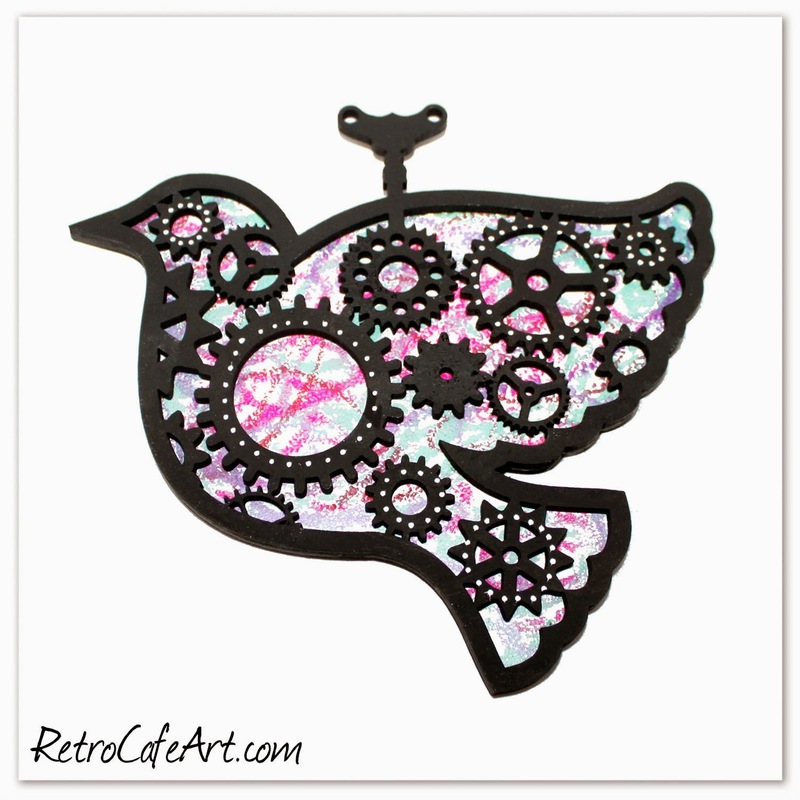 And of course the Steampunk Birds! I hope you love them too. First I made this sweet little ATC and a neat thing happened. We've been looking at new houses off and on for a few months now. We're not in a hurry to move, but wouldn't mind upgrading a bit. Yesterday we looked at a house that has the most promise yet. While making my ATC I was thinking that the word "home" would be perfect for the theme. I opened my 1949 garden book and there it was right there, the first word I opened to, "home". Maybe it's a sign? 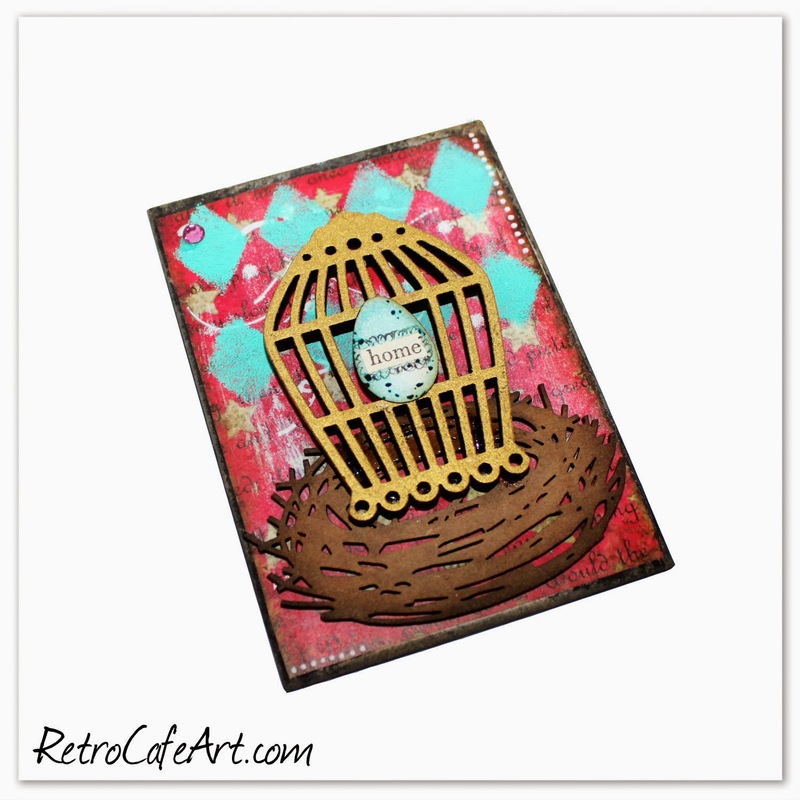 Supplies Used: Chipboard Nest Cut Outs, Masonite Bird Cage Cut Outs, Black Mat Board ATC Base, Egg Paper Cuts, Small Diamond Stencil, Halftone Stencil, Retro Pattern Grunge Collage Sheet, Gelatos Gift Set, Glue N Seal, Sharpie White Paint Marker. This guy was very fun and easy to make. And took very few supplies! I was curious if Gelatos would work well directly applied to white paint and it worked perfectly. I painted my bird base with white acrylic paint and then scribbled on my Gelatos. I didn't blend them since I loved the look. Then I simply painted the "frame" with black acrylic paint and added some Sharpie dots! 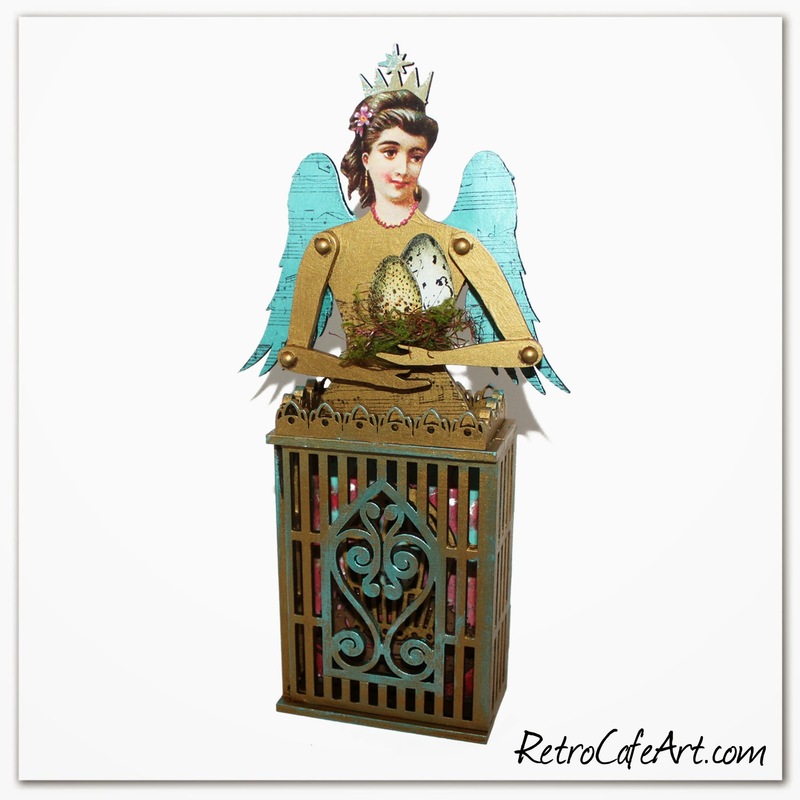 While we're on the top of Steampunk, I wanted to share this gorgeous piece with you using our Santos Doll Shrine Kit. She was created by Krystal Lynn and posted to our Facebook Fan page. Don't you just love all the metal bits? Thank you for sharing your talent with us Krystal! 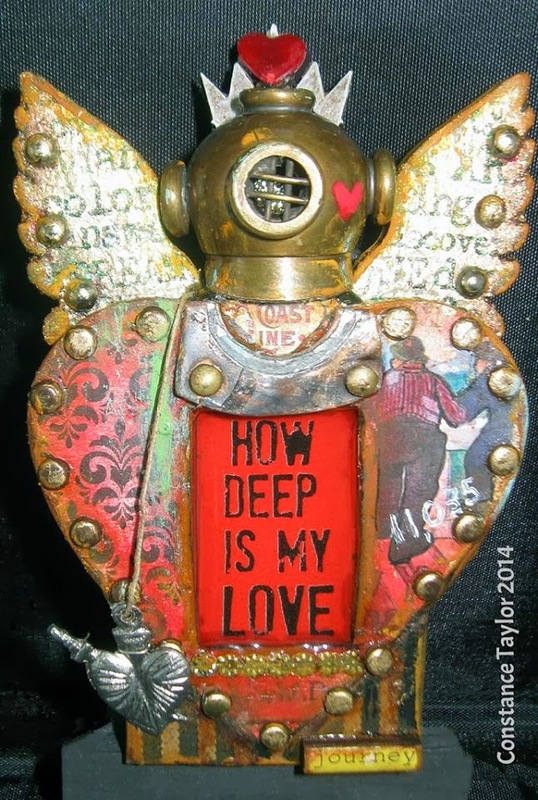 Here is another stunning Steampunk piece created by Design Team Member Lynn Stevens using our Steampunk Heart Ornament. Of course this ornament would go nicely with the brand new Steampunk Bird Ornament! 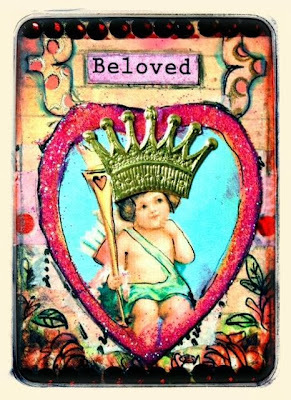 I love the combination of Steampunk and Valentine's Day! 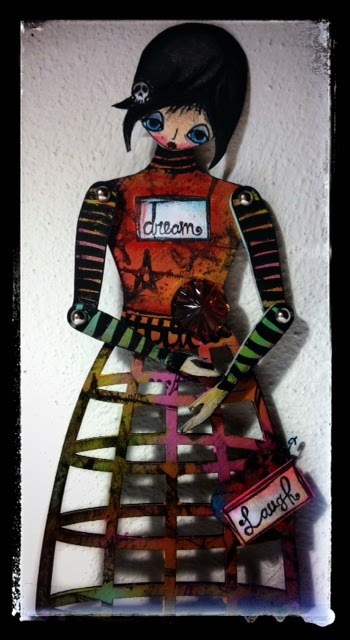 And how adorable is this Dress Form Art Doll by Design Team Member Amy Nieman! I'm in love with her colorful dress and all those stripes. So fantastic! More Manikin Doll Kits and Glitter Galore! Happy Saturday everyone! We have some super fun new goodies in the shop including more Manikin Doll Kits featuring several Coffee Break Design favorites, more new Inka Gold colors, Distress Inks and tools, Distress Glitter galore, and a few other Ranger products. I hope wherever you are, you are warm and safe. It's supposed to be 42 degrees here today - heat wave! I had a blast playing with a few of our new Doll Kits. You may recognize them from several other Coffee Break Design products. Now they are larger and even more fun to play with. 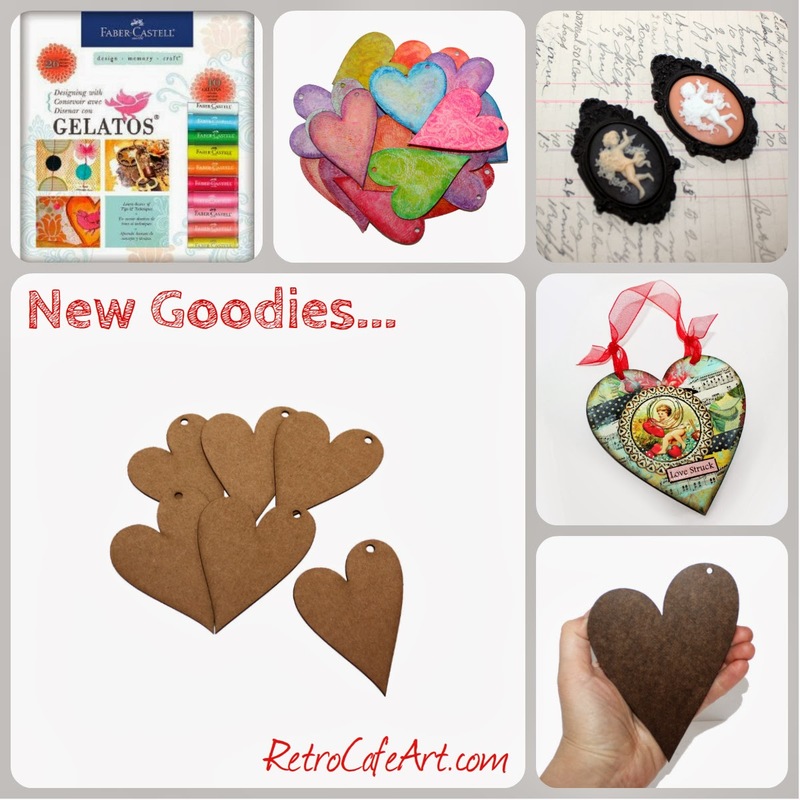 And it's no coincidence that they were perfect for more play with Gelatos! To make my dolls, I colored the included white Cardstock Paper Cut with Gelatos (the Gift Set includes a perfect skin tone) cutting the Paper Cut as needed. 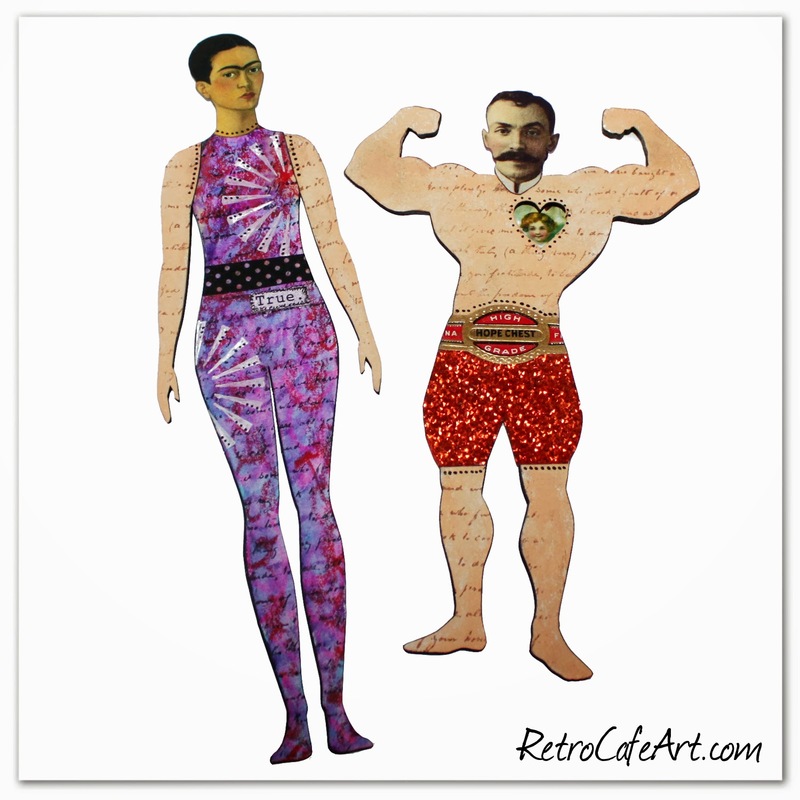 For the Muscle Man's shorts, I used part of the Paper Cut as a template - the red sparkly bit is from the cover of a Rolling Stones Magazine. I never throw away beautiful papers! I finished off the pieces with some stamping, collage, and stenciling, and then attached the bits using Glue N Seal. (I love that brush top lid!) The Cigar Label I picked says "High Grace Hope Chest". Perfect for Mr. Muscle Man! Check out this stunning Steampunk Heart by Design Team Member Linda Cain! 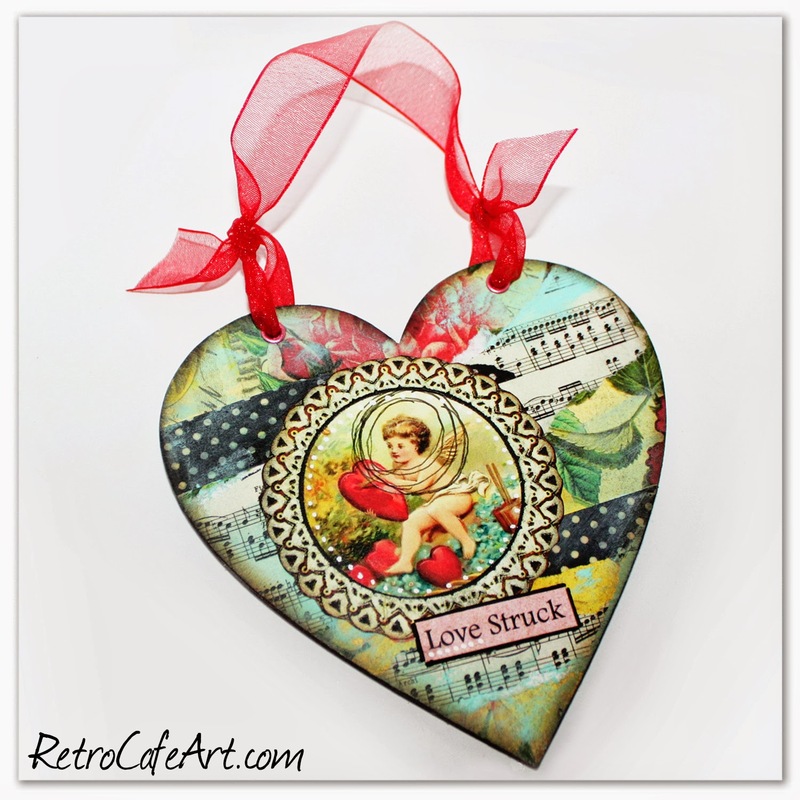 Hop on over to Linda's blog for more photos and step-outs of this wonderful piece! 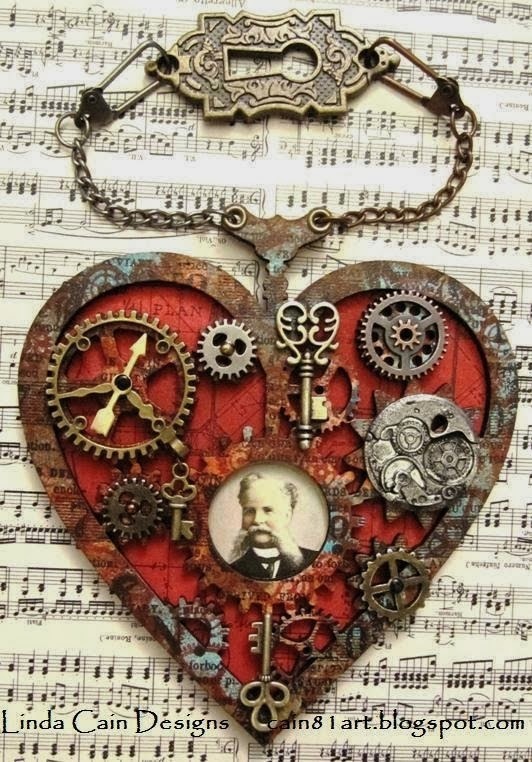 Layered Masonite Steampunk Heart, Antique Silver Faux Charm, Antique Brass Skeleton Key Charm, Tim Holtz Mini Gears, Brass Arrows, Tim Holtz Steampunk Stamp Set, Vintage Music Sheet II, Time Travelers Collage Sheet. The stunning fairies below are by Design Team Member Lynn Stevens! Each time I look at them, I discover something new. So awesome Lynn! 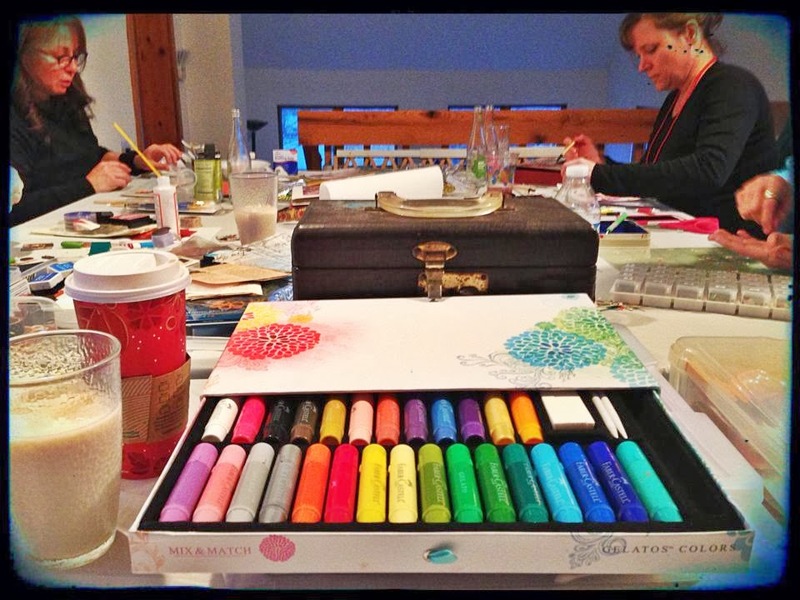 To close, we have a shout-out for an awesome online art class event! 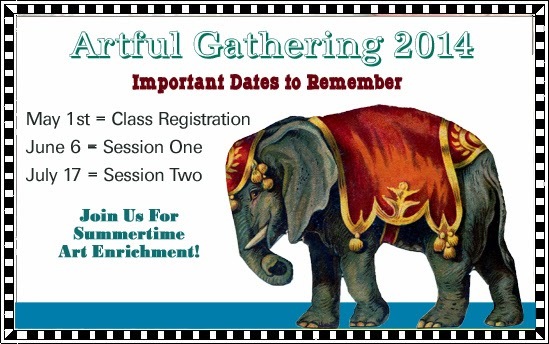 Artful Gathering Online Art Retreats 2014 opens for attendee sign-up on Feb. 1. Check out exciting new art workshops, new and returning faculty, and loads of fun activities! Water Color HeARTs and More! Happy Saturday everyone! As many of you know, I'm obsessed with Gelatos lately! They work well on many materials, however since they are water-based they work best on Water Color Paper! So today, just in time for Valentine's day and my Gelatos obsession, we have Water Color Paper and Masonite Heart Sets, New Cameos, not surprisingly a new Gelatos Set (smaller than the gift set), and more! 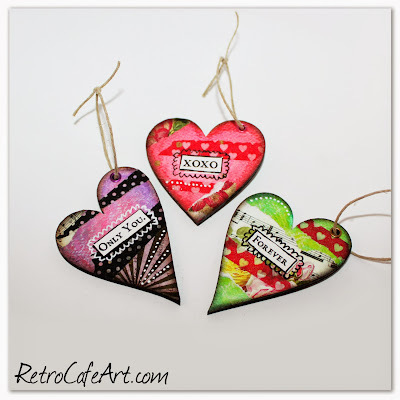 These sweet hearts were born not only for my desire to try all of the colors in my Gelatos Gift Set (as you can see I didn't stick with common Valentine's Day colors), but also as gifts for the Sweetheart Fairy Swappers! I generally make handmade gifts for the participants, however these will all be one of a kind! Time consuming, but I'm excited. Maybe a few per day? A little bit of daily art time is good for the soul! Wish me luck! These backgrounds are nothing but Gelatos and a water brush at this point. The supply list is for the next photo :). I also played with the new Large Masonite Heart Ornament. Very simple, but very fun. Sometimes there's nothing like good ol' paper and glue collage! 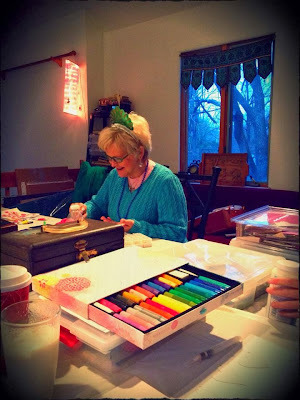 On New Years day, I had the pleasure of getting together with several of my good friends for a day of food, fun, and ART! Yes, we had tiaras too! 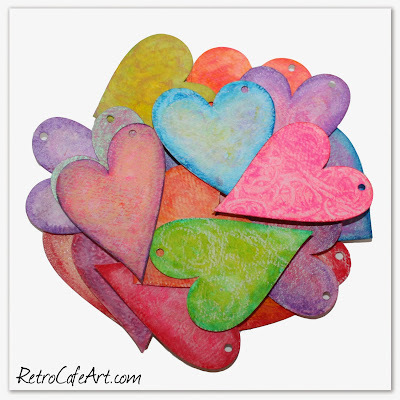 I worked on my heart backgrounds which was great since they required very little concentration. I was free to gab. Doesn't get much better than that! 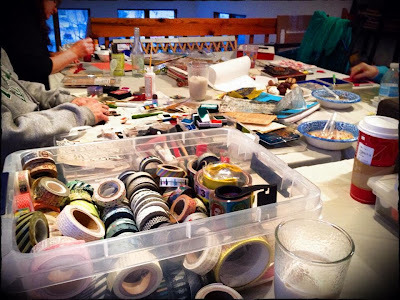 A messy art desk in numbers is way more fun! 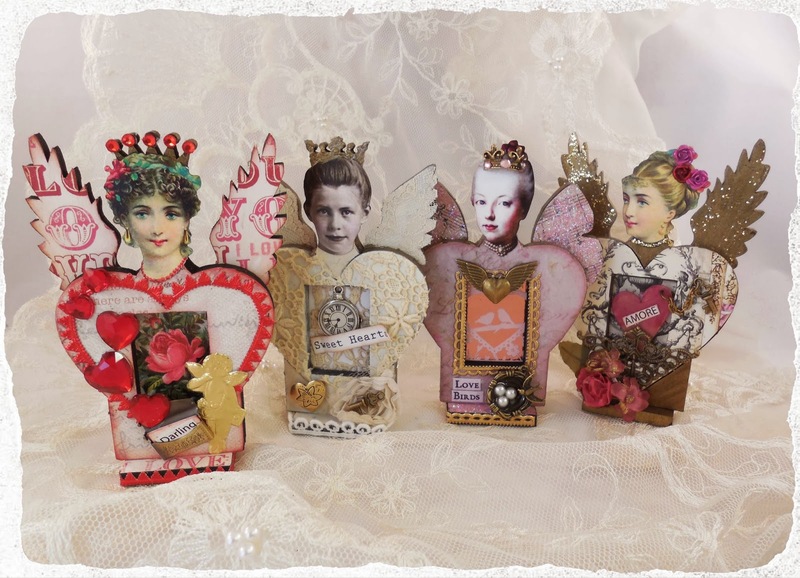 The stunning fairies above are by Design Team Member Linda Cain. You can find more photos and step outs on her blog HERE. Supplies: Sweetheart Fairy Shrine Kits,Arrow Cut Outs, Glasses and Monocles Cut Outs, Small Heart Tree Stencil, Valentine Collage Paper Cuts,Heart Mix Set,Valentine Word Cut Outs, Ornate Mini Frames, Antique Brass Winged Heart Charms, Antique Brass Love You Hand Charms, Gold Stickles, Silver Stickles, Christmas Red Stickles, Fairy Art Doll Head Paper Cut Outs. In case you missed it, Download this FREE Valentine ATC Collage Sheet HERE. 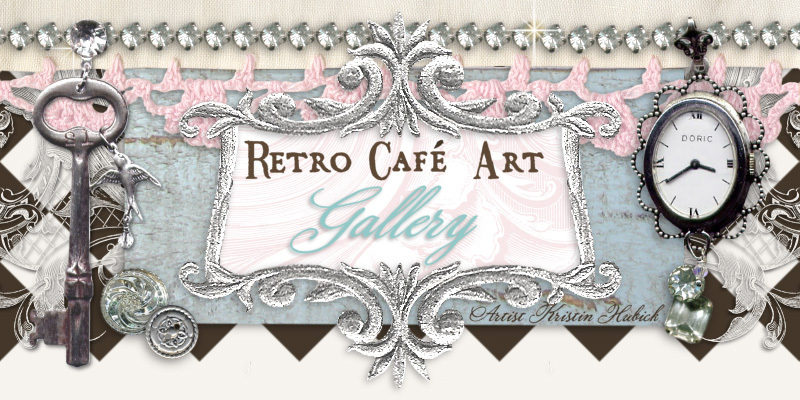 We love our customers at Retro Cafe Art Gallery and want to thank you for your support! We are THANKFUL for YOU and we are looking forward to a wonderful and creative 2014! Art Sample by Design Team Member Amy Nieman using this free sheet!